XM-25 Deployment It's hard to get out of this weapon's way PEO Soldier. 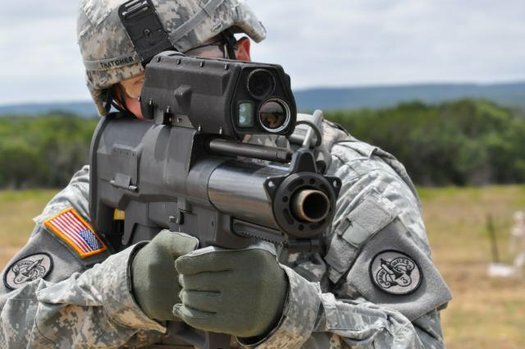 U.S. Army Special Forces soldiers will deploy with the XM-25 weapon this summer, so that they can shower enemies hidden inside buildings with lethal smart rounds. Veterans of the Afghanistan conflict who tried the weapon predicted it would be a "game changing" gun capable of taking out insurgents hidden behind cover, Military.com reports. The XM-25 resembles a highly sophisticated grenade launcher that fires laser-guided smart rounds. The laser gauges a distance to target and allows the warfighter to set where the round will detonate, adding or subtracting increments of 3 meters from the laser-spotted point. Then the scope tells a microchip inside the round how far it should travel before exploding. Each Heckler & Koch-made 25mm round actually holds two warheads that pack more punch than the current 40mm grenade launchers. Warfighters would basically have immediate, long-distance explosive firepower in rifle form, as opposed to having to wait on mortar strikes, artillery or airstrikes.